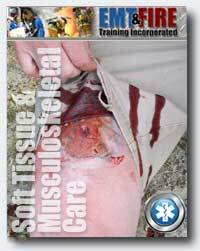 This EMT Soft Tissue & Muskuloskeletal Care CEU Course is available in two separate formats. Students may choose the Self Paced lecture or the Virtual Instructor Led Training (VILT). The Self Paced EMT Soft Tissue & Muskuloskeletal Care CEU lecture may be completed on the students own schedule. Students login online, watch the lectures and then take an assessment exam over the material. Once the exam is successfully completed with a score of 80% or better, the student is automatically issued a certificate of completion. Multiple exam attempts are permited. You may apply this course to the NREMT required hours of NON-live continuing education. 1. Describe the signs and treatment of an abdominal evisceration. 2. Demonstrate an understanding of the different types of musculoskeletal injuries and their treatments. 3. Distinquish the differences in treatment for injuries of different types to the neck. 4. List the types of closed soft tissue injuries. 5. Describe the emergency medical care of the patient with a closed soft tissue injury. 6. State the types of open soft tissue injuries. 7. Describe the emergency medical care of the patient with an open soft tissue injury. 8. Discuss the emergency medical care considerations for a patient with a penetrating chest injury. 9. State the emergency medical care considerations for a patient with an open wound to the abdomen. 10. Differentiate the care of an open wound to the chest from an open wound to the abdomen.